Porthcurno is the location of one of the most beautiful bays in Cornwall and home to the Porthcurno Telegraph Museum. 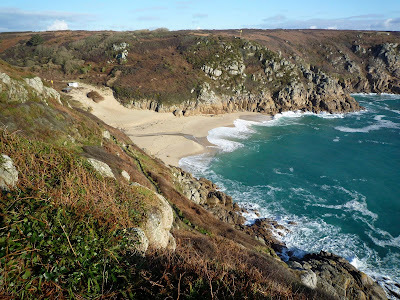 Although Porthcurno may not be the oldest subterranean cable landing point in the world, it could well be the site with the most connections. At least twenty-one old cables and pieces of abandoned shore ends lie beneath the sands. Fourteen of them once worked simultaneously at one time. The cable hut at the rear of the beach still connects these cables and a modern artwork near the museum presents the eerie sounds of the long defunct communication channels. The hut at Porthcurno has been chosen as it represents all those telegraphic sheds around the world that once played such a part in global communications. If anyone knows of any older please get in touch. Another hut high on the cliffs above Portcurno was where the transatlantic cable connected to the Cornwall-Brest-Nova Scotia came ashore. 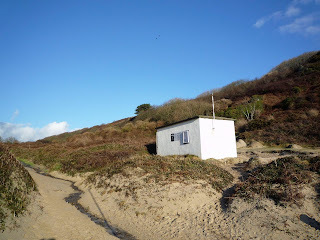 The old black hut outlived its usefulness as a cable house and took on a new lease of life as a summer holiday chalet. The National Trust then acquired this stretch of coastline and the hut was demolished. There were cries of protest from local fishermen who had used it to aid navigation. A small white stone pyramid (which is visible in the wide shot of the bay) was then erected to solve the problem. 1870 the Falmouth-Gibralter Cable Company laid the Gibralter-Lisbon cable into Porthcurno - or PK as it became known to telegraph operators around the world. The company started a small school in the valley for the operators. That developed into the Cable and Wireless College and more recently into a museum. Cable telegraphy was very simple. Messages were sent by hand on a key. At the other end the signals were picked up by the 'mirror galvanometer'. This reflected a flickering spot of light onto a screen next to the corresponding letter at speeds of around twelve words per minute. The 'reader' watched the spot and called out the words one by one, which were written down by the 'writer' in copperplate handwriting. There was no mechanical record. A word missed was missed for ever. In 1928 The Imperial Wireless and Cable Conference was held in London to resolve conflict between rival cable and wireless operators. Cable & Wireless was the name of the new group of operating companies, which still exists. In 1970 the last telegraph circuit was closed. Zawn is the Cornish word for a narrow gully or cleft in the rocks leading down to the sea. Zawn Reeth (or Red Zawn) near Land's End has historic significance as the site of the first submarine cable laid in Cornish waters. In October 1869 a small hut was erected at the top of the Zawn and a gang of men struggled to haul a heavy cable up the slope from the steamer Fusilier. aim was to lay the first operational The 1869 Telegraph Act had set a date by which all private telegraph companies were to be bought out by the government of the day who wanted to create a unified national network. 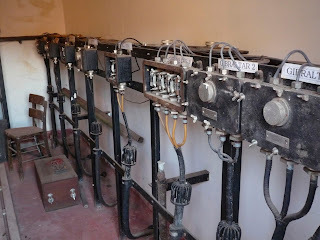 The owners of The Scilly Island Telegraph Company foresaw rich pickings but they had to have a fully operational cable link between the mainland and the islands. However, when the Fusilier arrived at St Mary in Scilly the following year, the cable turned out to be too short to reach the shore. So the Captain simply broke off the cable end and steered into port as though it was still connected. The success of Marconi's radio transmission across the Atlantic from the Poldhu Wireless Station sent shivers down the spines of the great submarine cable companies. The simplest way of finding out what Marconi was up to was to eavesdrop on his signals. The Eastern Telegraph Company erected a tall wooden mast near Minack and the aerial wire led into a small wooden shed housing the receiving equipment.